St. Moses was born about 332 AD. In his youth, he was the slave of a high government official who could not tolerate St. Moses’ dishonesty and violence. It was even said that St. Moses went so far as to commit murder. Finally, his master drove him out of his house. St. Moses became the head of a gang of seventy robbers. He was a strong and fierce man of huge stature. Saint Moses the Strong was martyred on the twenty-fourth day of the Coptic month Baoonah. St. Moses became very famous among the monks of Scetis because of his humility, his meekness and his love for strangers. His solitude was frequently interrupted by the influx of visitors. He went to St. Macarius and said, Father, I desire to live in silence, but the brethren never leave me. 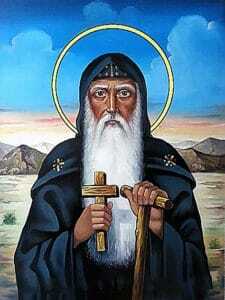 St. Macarius advised him to move to an isolated cell in Petra. Petra (literally rock) is the northern area of Scetis. It was a far area, difficult to reach, with scarce water. St. Moses lived in Petra for six years in a cave that he dug for himself in the rock. He became known as Abba Moses of Petra. Four virtues aid the young monk: continuous meditation on the word of God, watchfulness, fervent prayer and considering himself as nothing. One of his other sayings may summarize his spirituality: Humility of heart precedes all virtues, and the desire of the belly is the source of all passions. Pride is the basis of all vices and love is the origin of all goodness.